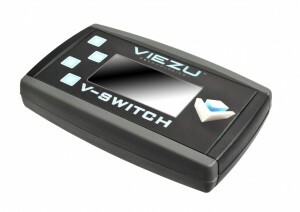 V Switch – Hundreds of new vehicles released The Viezu V switch is a unique switchable car tuning system which allows you, the driver, to choose your vehicle's tuning. Coverage has always been impressive but this week has seen the release of hundreds of new vehicles including Porsche, Mini, BMW and many many more, in fact over 2500 vehicles. V- Switch – A switchable car tuning system, allowing the driver access to switchable tuning files, so you can change you car tuning as often as you like, a driver operated self tuning multi tuning, ecu tuning system - and it can be posted anywhere in the world ! V-Switch is a portable, standalone customer based programmer that is truly simple to use and gives you ultimate flexibility in what you want from your vehicle. Designed to be used by the driver in the comfort of their own home it is capable of reading and writing tuning programmes for many different vehicle types. Uniquely, it can also store in its memory three different files dedicated to the same car – one original file and two tuned files. You can tune your cars to your heart's content with the V-Switch allowing you to change the power output of the engine in a matter of minutes. For the first time we are also now making our DPF removal and DPF delete tuning maps available to V-Switch customers, meaning you can remove the DPF ecu remap and reset your vehicle without a trip to the tuning shop V Switch really means that you can have your cake and eat it. With a choice of three engine tuning maps at your finger tips, you can switch between vehicle tuning options, and the standard vehicle setting whenever you wish.